Lamba Techno Flooring Solutions Pvt Ltd brings to Local Markets, New Technology of Reactive Colloidal Silica Nano Technology from Lythic USA for Densification & Dustproofing, creating “The HardWear FloorTM” for existing and newly trowelled green Concrete Floors. Until recently, all densifiers used alkali-metal compounds called “silicates” – such as sodium silicate, potassium silicate, or lithium silicate. Silicates are old technology. They have many drawbacks, which are overcome by a new type of densifier chemistry, colloidal silica Nano Technology. Reactive Colloidal Silica, nano-sized particles in an acqueous suspension is 99.5% pure silica suspended in an ultra-low surface tension liquid. The nanometer particles in their low viscosity suspension penetrate quickly, deeply, and cleanly into concrete. Reactive Colloidal Silica also bonds to itself, a property not found in any silicate densifier. They react very efficiently with lime in concrete, making them far more reactive than conventional silicate densifiers. These reactions form cementitious compounds in the concrete’s pores that harden and densify the surface. Colloidal silica works by reacting with lime in concrete. During hydration, approximately 20 % of a concrete mixture’s Portland cement is converted to lime, which has no structural value in concrete. However, colloidal silica pozzolanically reacts with lime to form CSH strengthening crystals. Concrete also contains naturally occurring silica. Because silica bonds best to itself (a property not found in any silicate densifier) colloidal silica is able to build up more density and strength in a concrete surface. It can be applied to new, hard-trowelled floors, or to existing slabs. Lythic Densifier eliminates the risk of whiting as it contains less than one half of 1 % metallic salts unlike other Silicate densifiers, which may have up to 25% metallic salts, and presents a risk of whiting of surface. The self-bonding ability is the driving force in our Lythic Protector, SPD Protector, and Lythic Cleaner products. Each delivers more silica, bonded into the floor, improving the surface with every application and ensuring that each application bonds tightly. Reactive Colloidal Silica densifier is far safer to handle than silicates. It has a pH similar to baking soda. Conventional sodium silicate densifiers are far more caustic and produce lye (sodium hydroxide) as a by-product. Lythic Products are water based and environment friendly. Safer for Workers and Jobsite: It is 100X-1000X times less caustic than silicates. Speeds up project: No, scrubbing in, no overnight curing, no scrub off. Safer for Environment: No caustic residue to scrub off and dispose of as a hazardous material. Shipped as concentrate to reduce transportation impacts. Works well on overlays too: Bonds directly to silica in the overlay cement, making it stronger and more polishable. Shipped as concentrate to save shipping costs. The Lythic HardWear Floor is a cost-effective alternative to diamond polishing. 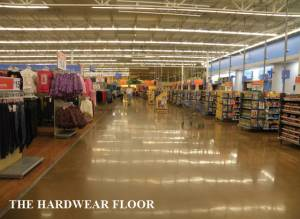 The Lythic HardWear Floor is based on a double treatment of Lythic Reactive Colloidal Silica densifiers. 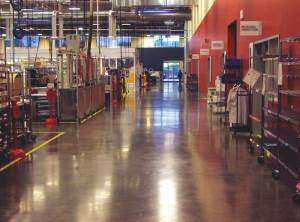 It can be applied to new, hard-trowelled floors, or to existing slabs with light grinding. 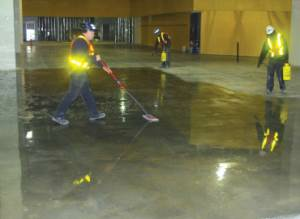 The first treatment, with standard Lythic Densifier, bonds silica particles of about 5-nanometre size to the concrete. This base layer forms a bonding surface (or landing pad) for a special version of the densifier, Lythic XL, with silica particles of about 45-nanometre size. These larger particles quickly build up density in the surface and may actually fill in finer scratch patterns. When this newly-made, high-silica surface is burnished, it produces a near-polished gloss. It eliminates two or three diamond-polishing passes, saving on the costs of both labour and diamond tooling. After stain protection, a 100-grit grind can resemble an 800-grit polish. It has all the performance properties of a polished concrete floor, and similar low maintenance requirements. Clean tools and equipment with water immediately after use. Residue from application and clean-up is non-toxic. Protect metals, glass, wood, paint or brick from contact with Lythic Densifier. If surface is accidentally over sprayed, wash immediately with potable water. Lythic Densifier : Lythic™ Densifier’s unique formulation of uniform, concentrated, Nano sized particles, suspended in an ultra low surface tension liquid, penetrates deeply into concrete surfaces bounding with the cement components of the slab. Lythic™ Densifier makes an extremely hard, dense floor surface that has increased wear resistance to foot and forklift traffic. It is water based and environment friendly and is VOC compliant in all states of USA. Protector : Lythic™ Protector is a penetrating concrete sealer formulated to enhance and protect polished concrete floors. It is a unique product that includes colloidal silica for surface hardness and lithium for water repellency. It is a water-based, environment friendly product that enhances coloured concrete floors, and increases durability, as well as slip resistance. XL Densifier : Lythic™ Densifier is a colloidal silica based concrete hardener and densifier that prevents dusting and increases durability in concrete floors. Engineered with a specifically sized silica particle, it is designed to strengthen soft porous concrete slabs. 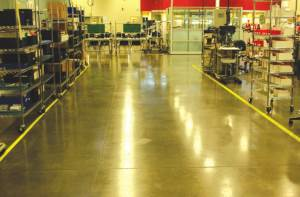 Floors treated with Lythic XL Densifier are durable and resistant to dusting and wear. 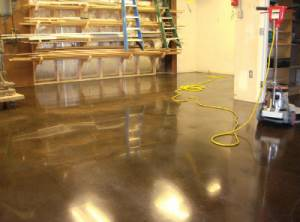 It fills the surface capillaries of concrete with silica creating a permanent bond that makes floor surfaces harder, less prone to dusting and the absorption of most liquids. Cleaner : Lythic™ Cleaner is a non-corrosive cleaner, formulated to remove surface dirt and soil from concrete floor surfaces. It fortifies concrete surfaces with amorphous silica as it cleans to increase durability and maintain surface polish.